Get your energy from the food you eat! It’s important that you eat soon after waking up, so why not make sure you pick the right thing? You need something filling, loaded with nutrients to fuel your body and of course…. something to give you a boost for the day ahead. Instead of always reaching for that pot of coffee try to grab healthy eats with an upper! I really love incorporating matcha in to my recipes. A breakfast prep I make often is matcha chia pudding or matcha baked oatmeal. I also really love matcha pancakes. For my pancake recipe you can bake them so they work for a meal prep too! Of course I have plenty of matcha smoothies all over the blog. As you can tell, I am all about saving time in the morning and waking up healthy! One great way to do this is grab and go breakfast bars. I usually make mine with a nut butter and oats, but this time I decided to use the nuts in a different way. 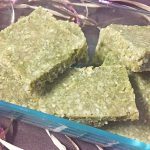 No seeds, dried fruits or additional add-ins needed for this recipe! It’s all packed in together in velvety squares. This recipe is seriously almost too easy. First soak your cashews in hot water and then drain and blend until creamy. This process may take about half an hour. Once ready place them on a baking sheet and top with coconut flakes, matcha powder and a drizzle of honey and coconut oil. You just combine all the ingredients and mash them until completely mixed. Press it in until flat and smooth. Make sure to really pack it down so it sticks together well. Then just place in a freezer for at least 30 minutes. 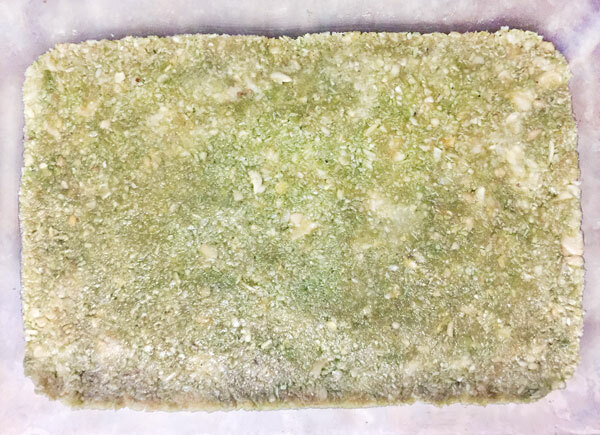 Remove and cut in to bars, then store in the fridge. Mine didn’t melt when left out, but I think for keeping longer cooling would be best. 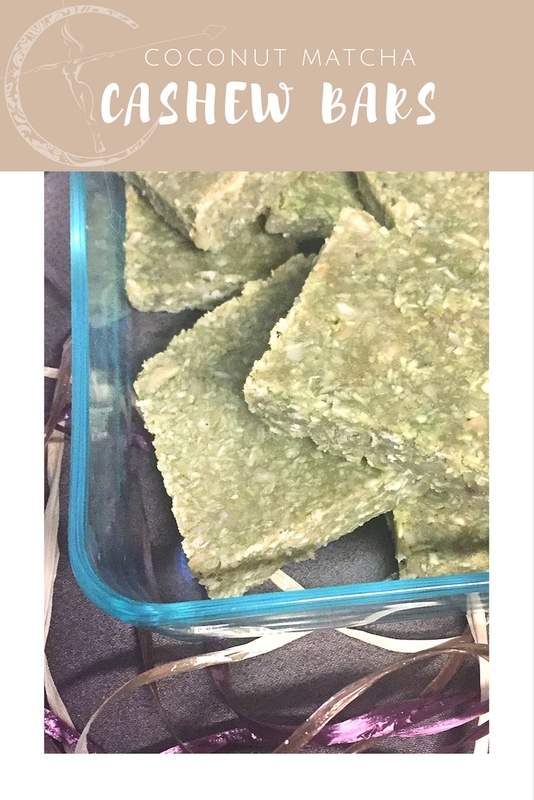 Breakfast bars made with cashews, coconut oil, shredded coconut and matcha powder. First soak your cashews in hot water and then drain and blend until creamy. Once ready place them on a baking sheet and top with coconut flakes, matcha powder and a drizzle of honey and coconut oil. Combine all the ingredients and mash them until completely mixed. Press it in until flat and smooth. Place in a freezer for at least 30 minutes. Remove and cut in to bars, then store in the fridge. 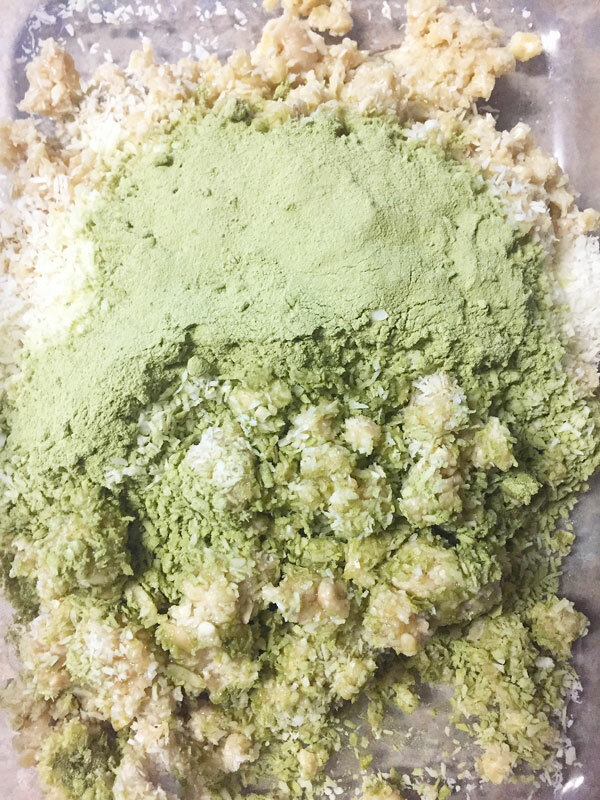 For an added benefit use my favorite matcha collagen powder to get some extra protein in! 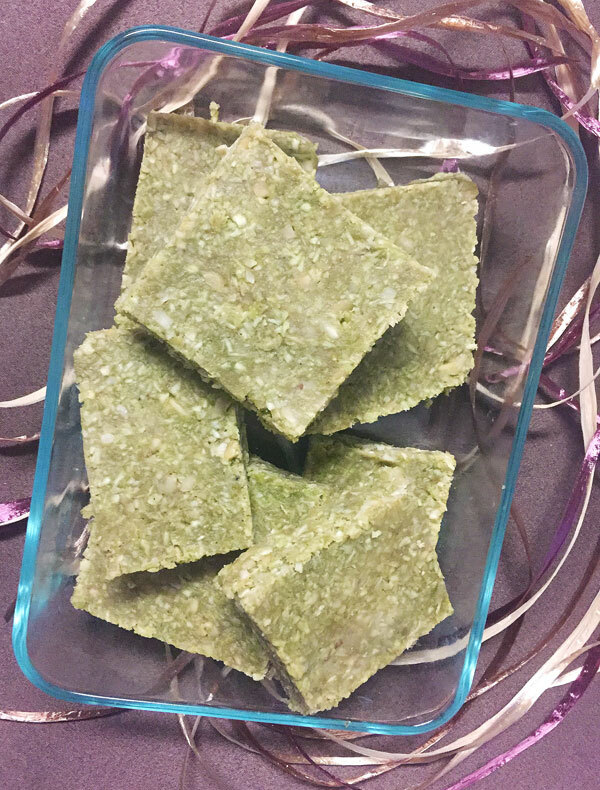 These matcha bars were delicious, rich and energizing! They provide fiber and protein plus give you glowing skin. Obviously you are also getting a load of healthy fats with each serving, so try to limit yourself daily! Yum! 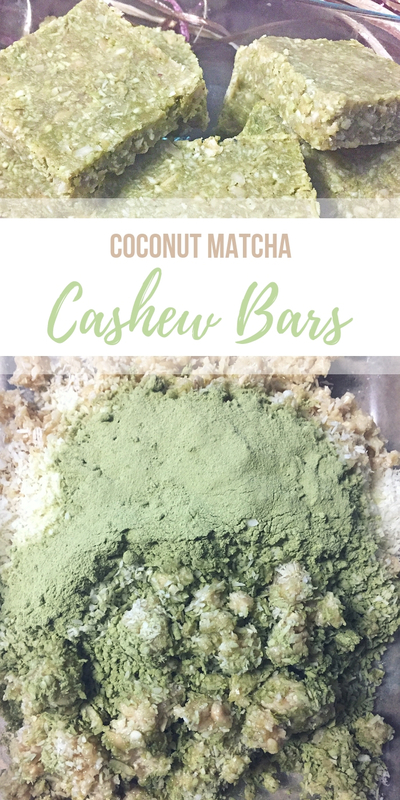 Love all the things you can make using matcha. These look especially delicious. And I bet they taste as good as they look. Thanks for sharing the recipe! They definitely do! Yes, if you can tell from my other recipes I really like to use matcha haha! Been looking for a matcha recipe to try, will have to give this a try!